Nestlé’s Häagen-Dazs brand today announced a new service in partnership with global recycling organization TerraCycle, that will provide a first-of-its-kind home delivery service to consumers called Loop. Loop will enable consumers to responsibly enjoy Häagen-Dazs and other household favorite foods and personal care products in customized, durable packaging that are collected, cleaned, refilled and re-used—all from the consumer’s front door step. Announced at the World Economic Forum, Loop was created to provide a solution to one of the world’s most pressing environmental issues: waste. Häagen-Dazs, alongside brands from other major CPG industry partners, examined its supply chain to identify ways to innovate in packaging, production and distribution. At the same time, the new service should maintain affordability and improve convenience and the consumer experience. 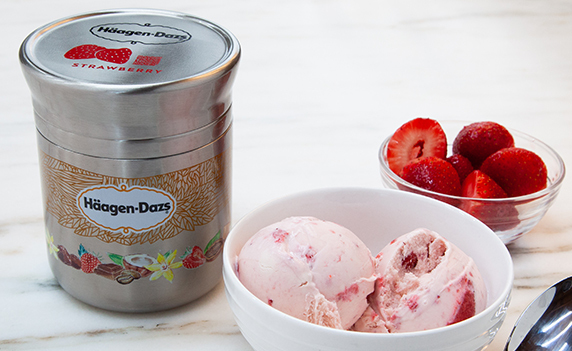 With the launch of Loop, Häagen-Dazs is debuting a reusable stainless steel double-walled ice cream container, designed by Nestlé’s global research and development group in Bakersfield, CA, that elevates the consumer experience and keeps the ice cream at optimal condition. The design and transportation will keep the ice cream fresh and cold from the moment the canisters are filled until they are delivered to consumers’ homes. The canister also ensures that when it is opened, the ice cream melts more quickly at the top than at the bottom of the container. This allows people to enjoy it perfectly without the ice cream melting. Consumers shopping for Häagen-Dazs on Loop can select from non-dairy options (Chocolate Salted Fudge, Coconut Caramel and Mocha Chocolate Cookie) or from traditional favorites (Vanilla or Strawberry) during the New York City pilot of the program, scheduled to launch in the first half of 2019. By 2025 the company has committed to making 100 percent of its packaging recyclable or reusable. It recently announced a series of specific actions to help reach this commitment, with a particular focus on avoiding plastic waste. Nestlé recently shared that its U.S. bottled water portfolio will use 25 percent recycled plastic by 2021 and will reach 50 percent recycled plastic by 2025. Last month, Nestlé announced the creation of the Nestlé Institute of Packaging Sciences dedicated to the discovery and development of functional, safe and environmentally friendly packaging solutions. For more information about Nestlé’s broader efforts to improve the environmental performance of its packaging, visit www.nestle.com/csv/impact/environment/packaging. Nestlé is the world’s largest food and beverage company. It is present in 189 countries around the world, and its 328,000 employees are committed to Nestlé’s purpose of enhancing quality of life and contributing to a healthier future. Nestlé offers a wide portfolio of products and services for people and their pets throughout their lives. Its more than 2,000 brands range from global icons like Nescafé or Nespresso to local favorites like Stouffers and Purina. Company performance is driven by its Nutrition, Health and Wellness strategy. Nestlé is based in the Swiss town of Vevey where it was founded more than 150 years ago. The United States is Nestlé S.A.’s largest market with combined product sales in the United States totaling more than $27 billion in 2017.